There’s a good reason why a sideboard is such a popular item of furniture, it’s one of our most versatile pieces! Not only do they function perfectly as a space-saving storage facility, but they’re also a stylish accent piece, or an extra surface to display your belongings. Side cupboards are such highly regarded pieces and can completely transform a room, hence why they have stood the test of time! Choose from traditional and contemporary sideboard styles made from high-quality solid oak or mango wood and painted finishes such as grey or white. Whether you prefer metal, wood or in-built handles, our cabinets are finished with a range of stylish touches. Our beautiful sideboards are ideal for storing plates, cutlery and any other dining and living room essential items. Although our range is so versatile it would look just as good in a kitchen, hallway, or landing. All our sideboards are built to the highest standards and use solid hardwood throughout, even the bases, backs, and drawers. All the dovetail joints have been screwed, pinned and glued to ensure supreme strength and longevity. Deep drawers and roomy cupboards provide plenty of space for stashing away household items. Enjoy free delivery on all our orders, our friendly delivery team will even carry your item to your room of choice. Don’t worry about paying for everything up front; we offer flexible furniture financing to help you spread the costs. Purchases over £500 can be paid back over a maximum of four years and purchases over £3,500 qualify for interest-free credit up to three years. Oak sideboards are a versatile addition to any home and can be used in many different rooms of the house, whether that’s the dining room paired with a dining table, living room matched to a coffee table, combined with a dresser in the kitchen, or placed below a clock in a hallway. Incorporate a side cupboard in the dining room to keep crockery and cutlery in easy reach or place it in the living room to store books, games or any other loose living room items that need a home. A sideboard can also serve as a stylish drinks cabinet in the kitchen, perfect for when you have guests over and want to show off your cocktail making skills. 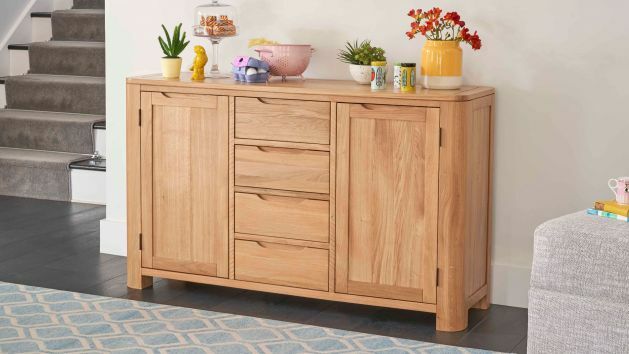 If you don't have enough space in your hallway, our small sideboards is a great way to add interest or fill an unused gap. Use the inside cupboard space to store shoes and house your phone, plants, and family decorations on the top surface. You could also use a sideboard to create a focal point in an unused alcove in the living room or kitchen – perhaps in the space next to a chimney breast, for example. In this case, our large sideboards would be a ideal feature piece.